Pancakes are a sometimes treat for us. I don’t do a lot of low-carb and paleo baking because I don’t want to get in the habit of eating baked goods. I prefer to stay pretty basic. However, from time to time, I get bit by the baking bug. While pancakes aren’t quite baking, they have a lot of similarities. In fact, with a few modifications this recipe also makes tasty muffins. In a medium bowl, whisk together the coconut flour, baking powder, and salt. In another medium bowl, whisk together the eggs, coconut oil, stevia, vanilla, and coconut milk. Carefully fold the wet ingredients into the dry, stirring until just combined. Heat a skillet on medium-high. Grease it with the coconut oil. Ladle the pancakes onto the skillet, dropping blueberries on each pancake. Cook until the pancakes bubble, about four minutes. Flip and cook a few more minutes on the other side. Serve with the syrup. In a small saucepan, bring all ingredients to a simmer on medium-high heat, stirring occasionally. Simmer for five minutes. Turn off heat and allow the syrup to steep for one hour. The syrup won’t be thick like you’re used to, but it will add wonderful flavor to your pancakes. This recipe is not strictly paleo because I use a few non-paleo ingredients. But it’s still low-carb and pretty darn delicious. While I avoid non-paleo ingredients 80 to 90 percent of the time, I occasionally do use them. I like to serve the meatballs with leaves of tender butter lettuce. Wrap the meatball in the lettuce and dip it in the tasty sauce. Preheat the oven to 400 degrees Fahrenheit. Line a baking sheet with foil. In a large bowl, mix all of the meatball ingredients together (except for lettuce leaves). Use your hands to mix well. 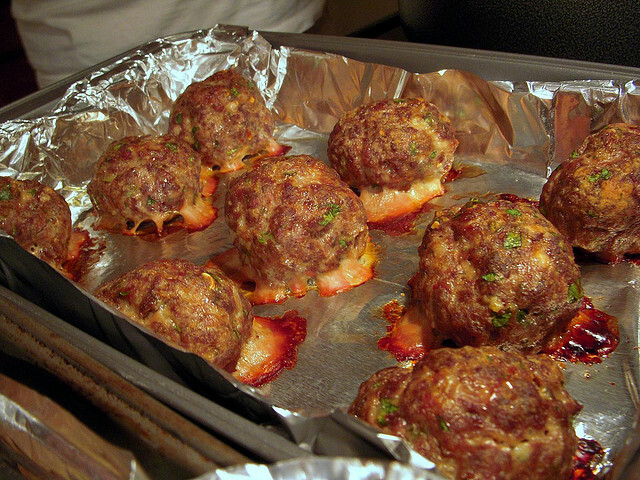 Roll into medium-sized meatballs and bake for 30 minutes. Serve wrapped in lettuce leaves dipped in the sauce. Whisk all ingredients together in a small bowl. Start by adding a little of the garlic chili sauce or chili oil, and then adding more to achieve the desired level of heat. I know – more mushrooms. Like I said in an earlier post, fall is the perfect time to find delicious seasonal mushrooms, so I take advantage of the bounty. Plus, I love mushrooms. If you don’t care for them, go ahead and leave them out of this delicious paleo recipe. I use a modified version of Rick Bayless’s garlic mojo. Make the mojo ahead of time, and keep it tightly sealed in the refrigerator for several weeks. Then, use the garlic mojo in the recipe. In a square glass pan (8×8″), spread the garlic along the bottom of the pan. Pour the olive oil or fat over the top. Add the salt and stir to combine, making sure all of the cloves are completely covered with oil. If they aren’t, add a little more oil or remove a few garlic cloves. Bake in the preheated oven until the garlic begins to turn golden, 45 to 50 minutes. Remove the garlic from the oven and stir in the lime juice and chipotle. Return the pan to the oven and continue baking for an additional 20 minutes. Remove the garlic mojo from the oven and mash the garlic cloves with a potato masher or a fork. Allow the garlic mojo to cool completely and then put it in a container that seals tightly. Refrigerate for up to 90 days. Be sure the garlic remains submerged in oil when you store it. Stir the garlic mojo before measuring it. In a large saute pan, heat two tablespoons of the garlic mojo over medium-high heat. Add the shrimp and cook until it turns pink, about six minutes. 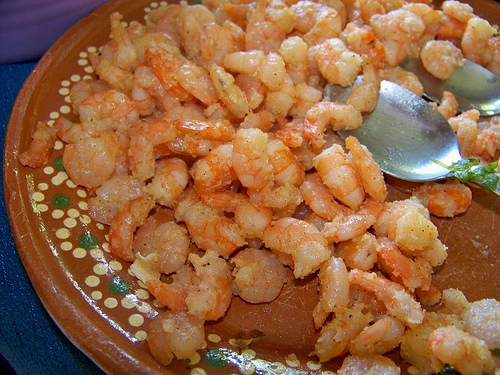 Remove the shrimp with a slotted spoon and set it aside on a platter. Add the remaining two tablespoons of garlic mojo to the sauté pan. Add the onion and mushrooms and cook, stirring occasionally, until they are soft and begin to brown, six to eight minutes. Return the shrimp and any juices that have collected on the platter to the sauté pan. Add the lime juice, chipotle chili and sea salt. Cook, stirring constantly, until the shrimp heats through, about four minutes. Serve the garlic mojo using the lettuce leaves as tortillas. Top with guacamole and pico de gallo. Tendergrass farms makes a tasty grass-fed, sugar-free Italian sausage. I really like it, and so I enjoy using it in soups, spaghetti sauce (with zucchini spaghetti of course), and other recipes. In the fall when delicious mushrooms are so abundant, I especially enjoy mushroom dishes, which is why you’re seeing so many of them in my recipe feed lately. This soup is delicious and hearty. It really hits the spot on a cold fall evening. I use my typical thickening method…pureeing the vegetables and adding them back into the broth, because it works so well. Preheat your oven to 350 degrees Fahrenheit. Place the cut garlic heads on a large piece of foil. Drizzle them with two tablespoons of the melted fat and sprinkle them with salt and rosemary. Wrap them in the foil. Roast the garlic in the preheated oven for about 90 minutes, until soft. Allow it to cool slightly, and then squeeze the cloves out of the papery skin and into a bowl. Set aside. In a large saucepan, heat the bone broth until it simmers. Remove the broth from the heat and add the dried porcini mushrooms. Cover and allow the mushrooms to soak until they are soft, about two hours. In a large dutch oven, heat three tablespoons of fat over medium-high heat until it shimmers. Add the Italian sausage and cook, breaking the sausage apart with a spoon, until it is browned, five to seven minutes. Remove the sausage from the fat with a slotted spoon and set aside on a platter. Add the onion to the fat in the pan and cook over medium heat, stirring occasionally, until it softens and begins to brown, five to seven minutes. Remove the onions from the fat with a slotted spoon and set it aside in the bowl of a food processor fitted with a metal chopping blade. If needed, add a little more fat to the pan. Over medium-high heat, cook the mushrooms in the fat, stirring occasionally, until they soften, seven to ten minutes. Remove the mushrooms from the fat with a slotted spoon. Put half of the mushrooms into the food processor with the onions and put the remaining half on the platter with the Italian sausage. Add the fennel to the remaining fat in the pan (or add a bit more if necessary). Cook over medium-high heat, stirring occasionally, until the fennel is soft, five to seven minutes. Add the red wine to the pot. Using the side of your spoon, scrape any browned bits from the bottom of the pan. Use a slotted spoon to remove the reconstituted porcini mushrooms from the stock and put them in the food processor with the other vegetables. Pour the stock into the cooking pot. Add the cooked sausage and mushrooms from the platter, thyme, red pepper flakes, salt, and pepper to the pot. Reduce the heat to medium-low and allow it to simmer. Meanwhile, add the roasted garlic to the food processor with the mushrooms and onions. Process until the vegetables form a smooth paste, 30 seconds to one minute. Stir the vegetables back into the pot of soup to thicken it. Cook, stirring occasionally, until the soup warms through, about five more minutes. Adjust seasoning as necessary. Serve garnished with fennel fronds. In a large saucepan, heat the bone broth until it simmers. Remove the broth from the heat and add the dried porcini mushrooms. Cover and allow the mushrooms to soak until they are soft, about two hours. 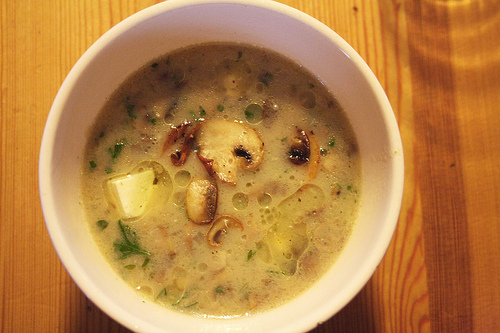 Remove the mushrooms from the broth and chop them roughly. Return them to the broth. Add the onion to the fat in the pan and cook over medium heat, stirring occasionally, until it softens and begins to brown, five to seven minutes. Remove the onions from the fat with a slotted spoon and set it aside with the sausage. If needed, add a little more fat to the pan. Over medium-high heat, cook the mushrooms in the fat, stirring occasionally, until they soften and brown, seven to ten minutes. Remove the mushrooms from the fat with a slotted spoon. Set them aside with the sausage. Add the fennel to the remaining fat in the pan (or add a bit more if necessary). Cook over medium-high heat, stirring occasionally, until the fennel is soft, five to seven minutes. Add the garlic and cook, stirring constantly, until it is fragrant, about 30 seconds. Add the sherry to the pot. Using the side of your spoon, scrape any browned bits from the bottom of the pan. Pour the stock into the cooking pot. Add the cooked sausage, mushrooms, and onions back to the pot along with the thyme, red pepper flakes, salt, and pepper. Reduce the heat to medium-low and allow it to simmer. In a small bowl, whisk together the arrowroot powder and water. Pour them into the simmering pot, stirring constantly, until the soup thickens slightly.